Swimming and water fitness activities deliver a long list of health benefits. Swimming has been considered to be the most complete physical activity you can do. That means you are working all the muscles in your body. The best part is moving around in water can feel almost weightless making it easy on the body while controlling the exact amount of work out you want to achieve. That is important as it is easier on the joints and tendons and doesn’t put a strain on connective tissue like jogging can. Water activities rarely lead to injury and many people find it fun. That’s why it is enjoyed by so many people. 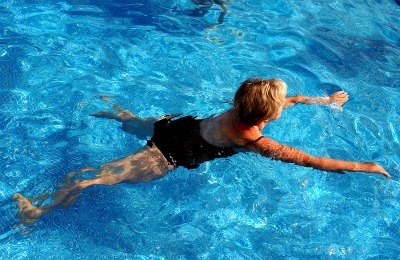 It doesn’t matter if you are young or old, big or small, we can all benefit from swimming. Water activities can be extremely beneficial for people who struggle with obesity. It is much easier to work out in water than other types of exercise such as running or cycling. Depending on the level of water fitness you are doing you can get a great cardiovascular workout. Splashing around in the water can burn a lot of calories. Along with a sensible diet that includes eating healthy foods it is a great way to accelerate weight loss. All forms of exercise, when done regularly, can help reduce mild to moderate depression. This stems from the fact that greater self esteem and higher energy levels are achieved. Physical activity in water offers what is called resistance exercise which helps strengthen muscles. This is simply because water creates resistance when you are moving through it. Water is actually quite heavy and even though our bodies feel much lighter when in water our muscles are working harder than we realize improving muscle strength. Since you can float in water, aquatic fitness also helps us maintain flexibility or improve on it. This is because water helps support the body during exercises which can help the body become more limber. It is no wonder that many therapists recommend water exercises for people that suffer from limited motor ability, such as stroke patients, accident victims or people recovering from joint replacement. Most people are well on their way with a bathing suit, cap and goggles which can all be purchased easily and at a reasonable price. Check your local community centers to see which ones are equipped with a pool. Many YMCA facilities have one. Then there are home pools, lakes and of course swimming in the ocean is enjoyed by many depending on climate and location. If you love the water you can also enjoy water aerobics, water jogging, water walking, water yoga, water Pilates and water volleyball which offer similar benefits. Community centers offer a variety of water activities to choose from. Joining these programs are also a great way to make new friends that have similar interests and goals. The benefits of exercise are many no matter which type of physical activity you choose, but if you enjoy being in the water swimming is a fantastic choice.